Lesjöfors produce a comprehensive range of OE matching quality gas springs, and our current catalogue features over 1000 part numbers, most complete with end fittings and covering almost every European & Asian vehicle. 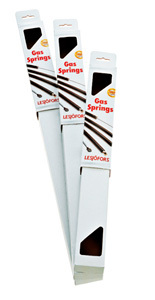 Quality - Lesjöfors gas springs are of the highest quality but do have a finite lifespan. Learn how to get the most out of your gas springs.